Since 2000 over 150,000 eBay users have used BidSlammer as their eBay auction sniper to win for less. To date, BidSlammer has successfully sniped over 20,000,000 items on eBay. 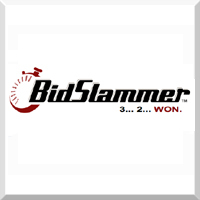 BidSlammer is an eBay bid placement service. We allow you to secretly arrange a bid for an eBay auction. BidSlammer will place the bid precisely at five seconds before the auction closes. You avoid overpaying in bidding wars and won't ever lose an auction because you forgot to go in and manually place the bid at the last minute. You don't even have to be online. $10 for pay-per-use. $8 per month for unlimited use. No charges for missing snipes. BidSlammer allows you to secretly arrange a bid for an eBay auction. BidSlammer will place the bid precisely at five seconds before the auction closes.